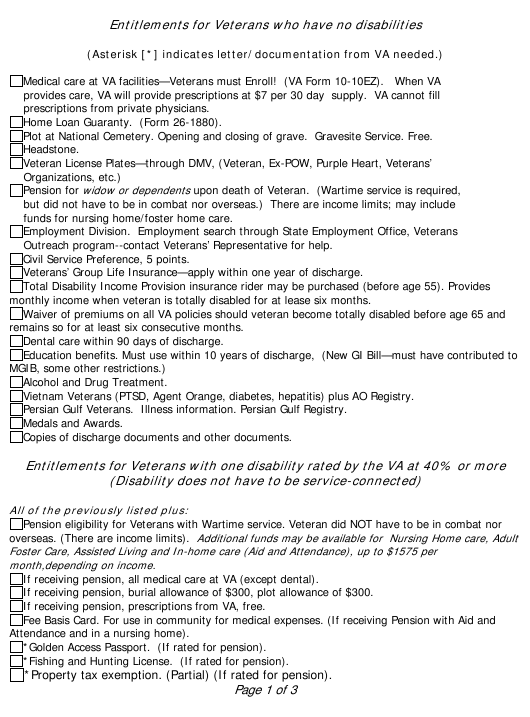 This Oregon-specific "Entitlements for Veterans Who Have No Disabilities Checklist Form" is a document released by the Oregon Department of Veterans Affairs. Home Loan Guaranty. (Form 26-1880). Plot at National Cemetery. Opening and closing of grave. Gravesite Service. Free. funds for nursing home/foster home care. Outreach program--contact Veterans’ Representative for help. Civil Service Preference, 5 points. Veterans’ Group Life Insurance—apply within one year of discharge. monthly income when veteran is totally disabled for at lease six months. remains so for at least six consecutive months. Dental care within 90 days of discharge. Vietnam Veterans (PTSD, Agent Orange, diabetes, hepatitis) plus AO Registry. Persian Gulf Veterans. Illness information. Persian Gulf Registry. Copies of discharge documents and other documents. overseas. (There are income limits). If receiving pension, all medical care at VA (except dental). If receiving pension, burial allowance of $300, plot allowance of $300. If receiving pension, prescriptions from VA, free. Attendance and in a nursing home). *Golden Access Passport. (If rated for pension). *Fishing and Hunting License. (If rated for pension). *Property tax exemption. (Partial) (If rated for pension). *Golden Access Passport. Free entry into National Parks that charge fees. Civil Service Preference, 5 or 10 points. Burial allowance of $300, $2000 if death caused by service-connected disability. Nursing home benefits paid in full if needed due to service-connected disability. offered, apply now.). Waiver of premiums possible when rating reaches 100%. Employment Division. Use of Disabled Veterans’ Outreach counselors. Possible eligibility for Vocational Rehabilitation. Dependency allowance added to VA compensation. Aid &Attendance allowance for spouse. change of discharge to medical retirement with retiree benefits. 40% with a combined total of 70%, OR, one condition rated at 60% or higher. Service-connected condition must be the cause of employment handicap. Medical care from the VA for ALL conditions and disabilities. world, including Tokyo, Hawaii, Orlando. *Waiver of Premiums on NSLI, VGLI, RH Disabled Insurance. ChampVA medical insurance for dependents. (Need P&T rating). Hearing aids, glasses and dental care. Possible Dependency and Indemnity Compensation for widow. more independent, productive, interactive in community. Possible—entitlement to specially adapted housing grant (for adaptations to home). Must be rated Permanently and Totally disabled. Possible—Mortgage Life Insurance. Must be rated Permanently and Totally disabled. (Insurance terminates at age 70). address below), or you may contact this office for help. If you mail your request to the VA, be sure your name, address and claim number are listed below. You will need the following information below when contacting the VA.